October's biggest overnight gainer was BONT from the 24th for an easy and non-volatile 122%. Alerted @ 0.61 on the 24th (Tues.) and saw highs of 1.35 the next day. Opened on a 77% gap-up and ran straight up. This was the biggest overnight gainer in MT history! October saw 375.5+% maximum profit potential after stop-outs of a mere -26.5% assuming every daily pick was bought and traded according to plan. 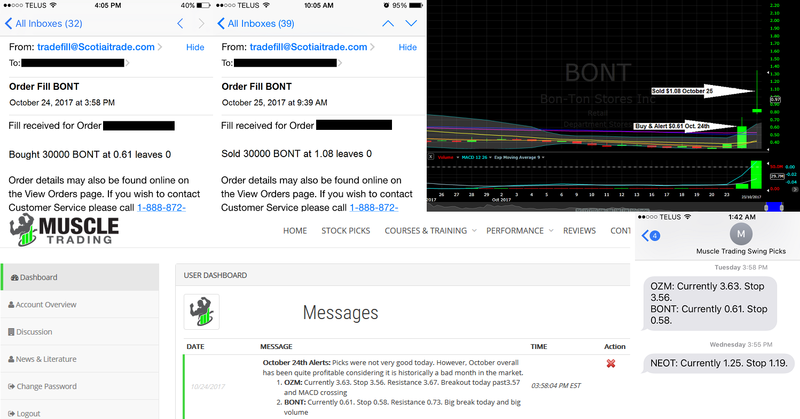 While BONT was a record overnight gainer totaling +122% from the 24th, we also saw big runners with HMNY from the 5th – 6th & 6th – 9th (+12% and +40%), BLDP from the 6th (+8%), CLSN from the 9th (+30%), AMMA from the 10th (+35%), AEMD from the 12th (+10%), ETRM from the 16th (+19.5%), BIOA & LINU from the 19th (+13%, +8%), NEOT from the 25th (+16%), APVO from the 26th (+11%), and TRXC & IMDZ from the 30th (+12% and +10%). All alerts are automatically posted in our members dashboard immediately upon being sent out through email and text.